Academic mothers don’t need encouragement to be ambitious and optimistic. They need relief from grossly inadequate support systems that deprive them of real choices and a fair shot at successful careers. In the now-viral clip of political science professor Robert E. Kelly’s BBC interview-gone-wrong from his home office, two toddlers crash through the door in the background, and slapstick hilarity ensues. Kelly’s harried wife rushes in and herds the tiny creatures out of the room, crawls on the floor, grabs for the knob and disappears behind the slammed door. Kelly, eyes closed, remains in the frame looking mortified in his necktie and blazer. A professor and parent to two young daughters, I see shades of my life in this funny clip—to a point. I, too, have locked myself in my home office for phone interviews, trying to sound focused and serious while praying that no toddler fists beat down the door, or high-pitched shrieks blow my cover of working from home. But I’ve done this without a wife to run interference. I have a husband who’s an excellent father, but when I’m working, he’s at work too. And because I had my first child as a contingent faculty member, ineligible for the university’s maternity leave, breastfed each baby for a year as recommended by the American Academy of Pediatrics, and struggled over the years to find affordable, high-quality child care, I’ve often had to work from home while also caring for my girls. This has meant doing two demanding, full-time jobs at once—or, more accurately, doing both at half-power. It’s tempting to buy into this myth, a kind of variation on the American Dream, because it sounds wonderful: You can care for your babies at home (avoiding costly and germy day care and the guilt of leaving your baby with strangers), write brilliant books while they nap all afternoon, teach classes at night while they’re home asleep, and achieve tenure. The work is hard, for sure, but the rewards are great. Among tenured faculty, 70% of men have children, compared with 44% of women. Mason attributes this gender discrepancy to academia’s rigid career track, which does not permit “time outs,” and demands that assistant professors perform to their highest potential early on, in their 30s and early 40s, which are prime childbearing years for women. One result is that women with children fall off the tenure track to fill the swelling ranks of the underclass of contingent faculty. Women today make up as much as 61% of contingent faculty, and many, if not most of them, are mothers. And yet, prime pushers of the “flexibility myth” are those who should know better: senior academic mothers who have managed, against the odds, to have it all. 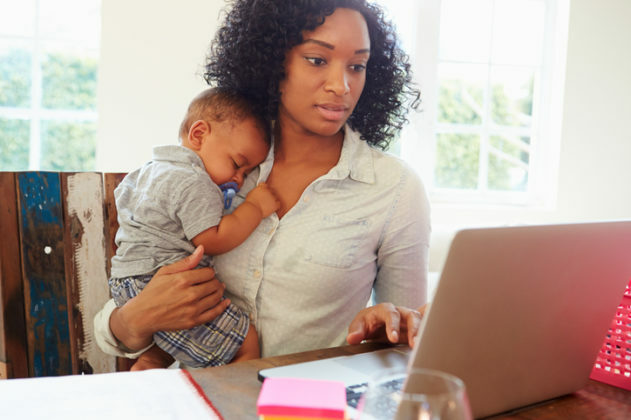 In op-eds and books with titles like “Academia and Motherhood: We Can Have Both” and “Professor Mommy: Managing Work-Life Balance in Academia,” they offer well-intentioned advice, much of it autobiographical, urging women to be ambitious and optimistic, not to count themselves out, and to take advantage of the flexibility of the academic life. Academic mothers don’t need encouragement to be ambitious and optimistic. They need relief from grossly inadequate support systems that deprive them of real choices and a fair shot at successful careers, and contribute to the persistent problem of women lagging behind men in tenure and promotion rates, and disproportionately filling the ranks of disadvantaged, disrespected, and underpaid contingent faculty. Mason argues that we need structural changes to create conditions of equal opportunity for men and women, mothers and fathers in academia—things like paid family leave for both mothers and fathers; a truly flexible workplace; a re-entry policy; childcare as a billable expense for work performed at night, on weekends, and out of town; pay equity reviews; and on-site, affordable, high-quality childcare. We also need a shift in culture. We need to permit open discussion of the grueling, if also rewarding, work of bearing, birthing, breastfeeding, and raising children. We need to acknowledge that gendered thinking about children as “naturally” women’s domain, and motherhood as a “private choice,” serve to legitimize institutional failures to support mothers. We also need to stop pushing the myth of academic flexibility. At best, it lets administrations off the hook to make the structural changes needed to allow mothers equal opportunities. At worst, it feeds the destructive idea that mothers are failing to succeed due to personal failings, rather than structural inequality. Here is what’s wrong with those articles and books: They advertise flexibility as a kind of freedom. They unwittingly urge us to internalize our second-class status by refusing to address the real structural problems that hold women back, and that are fixable. It may seem insensitive to focus on the challenges academic mothers face, when working class mothers have it much worse. But to achieve equality for women, mothers in all fields must have the freedom to work and flourish under humane conditions. Now is a great time to discuss honestly the challenges academic mothers face. For the first time since the 1970s, federally funded childcare and paid parental leave are being discussed at the national level, with Ivanka Trump apparently pushing a $500 billion child care plan. Those who favor increased support for academic mothers often make an economic argument: that investing in on-site childcare facilities and paid maternity leave will yield more and better quality labor from the women colleges and universities have invested in. This is a fine argument to make. It’s pragmatic and likely to persuade administrators who run our colleges and universities. With this insight, Rich invites us to imagine how glorious our shared intellectual and cultural life could be if academic mothers were truly free to devote themselves fully to their work. Eileen Kane, Ph.D., is a Professor of History at Connecticut College, Director of the school’s Global Islamic Studies program, and a Public Voices fellow.